Easy, quick, and scrumptious biscuits for some people (like me) who are too lazy to bring out the rolling pin and cookie cutter. In a large bowl, stir together flour, baking powder, sugar, cream of tartar, and salt. Cut in butter until mixture resembles coarse crumbs. Make a well in the center, add milk all at once. Add cheese and chopped green onions. Stir until the dough is well incorporated. Drop a generous tablespoon of dough onto the prepared baking sheet, repeat with the remaining dough, keep 1 or 2-inch space between them. Bake in the oven for 10-12 minutes or until golden. Serve warm. My family liked these. 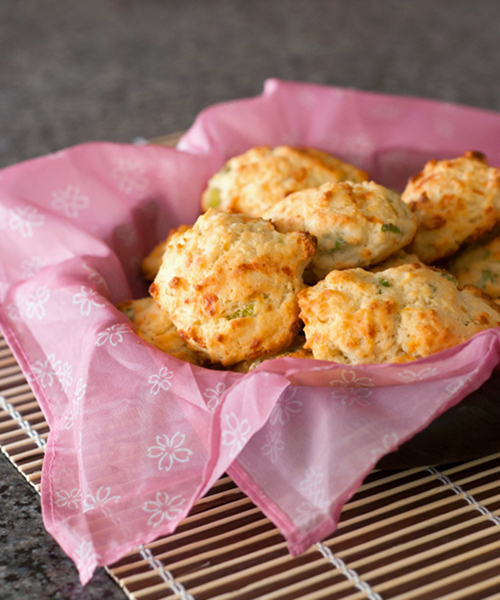 This was an easier version of the cheddar green onion scones I usually do. However I think next time I will do a smidge less sugar and a bit more flour. Thanks for the recipe!